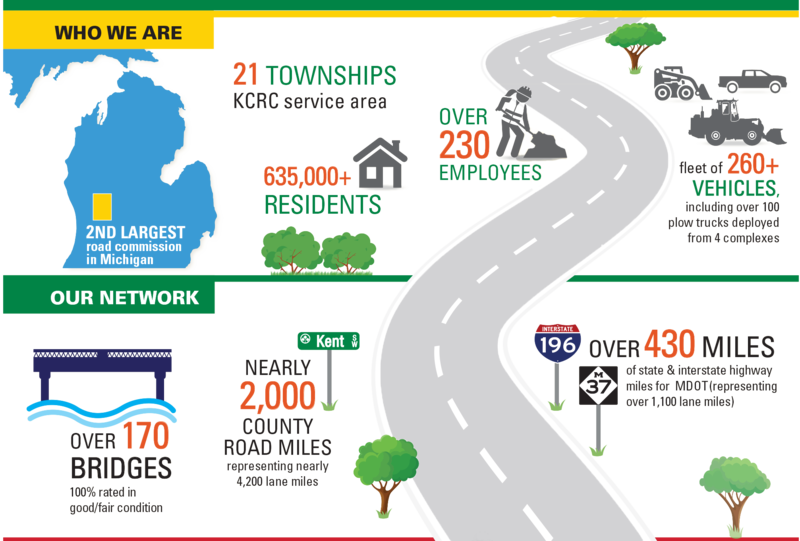 KCRC works to keep Kent County moving with a network of reliable, safe and convenient roads and bridges. We construct, maintain and preserve this network while collaborating with our townships and responding to the public’s needs. Our commitment to excellence is driven by our desire to employ best practices and efficient response times. Our experienced team takes pride in their work because– just like those we serve – our families drive these roads, too. Founded in 1911, KCRC maintains nearly 2,000 miles of roads and over 170 bridges within the County of Kent, exclusive of those roadways and bridges that fall under the jurisdiction of the State of Michigan, cities and villages. The Road Commission also provides routine maintenance services, including snow and ice removal, for over 430 miles of state trunklines under a multi-year contract with the Michigan Department of Transportation (MDOT). To serve Kent County with a safe, reliable, and efficient transportation network. To be a Premier County Transportation Network in Michigan. “Primary Roads” are generally longer distance, higher volume roadways of the county. Many are multi-lane corridors. Examples include 10 Mile Road, 84th Street, Whitneyville Avenue, and West River Drive. “Local Roads” are typically the shorter distance two-lane collector roads and residential streets within townships. Examples include Buttrick Avenue and Courtland Drive.